it’s design for life, sustainability, ergonomics, variability and clear structure. Moll was founded by the moll family in 1925 as a furniture manufacturer in Gruibingen, in the Swabian Alb (Baden-Württemberg, Germany). 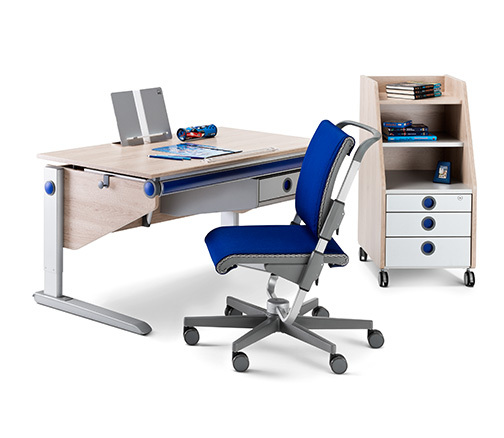 We are a global leader in expandable children’s desks, chairs, and organisational furniture. The typical features of moll products, developed and produced in Gruibingen, include high quality, ergonomics, durability, and the ability to modify over time. We have successfully marketed our products in over 30 countries around the world. 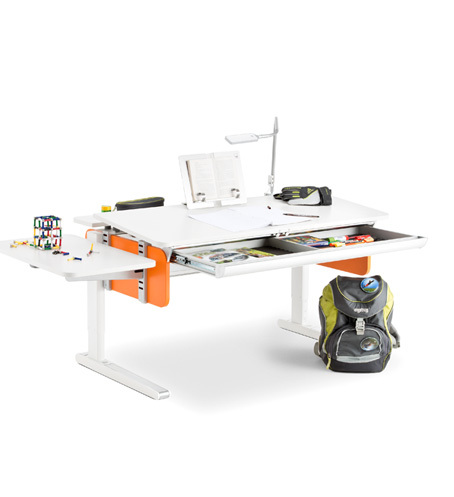 In 1974, we invented the world’s first adjustable-height children’s desk with a tilting work surface. With the introduction of the basic system in the 1990s,we were the first manufacturer of children’s furniture to offer a complete system of adaptable furniture that grows with children and teenagers. When children grow up, their needs for space and features change. This is why moll builds desks as a system. They have to grow in order to keep working tomorrow as well. This pays for itself, too. Our desks, chairs, and lamps together provide complete workstations for children and teenagers, growing with them from elementary school to graduation. These systems feature many expansions that can be combined individually. Future needs for work areas and functions are covered. For example, they provide expansions for computers and monitors. 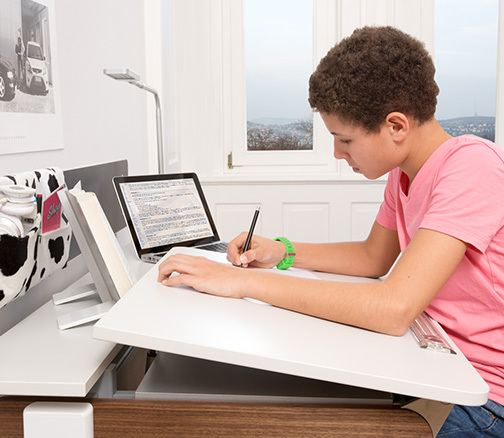 This combination of innovation and quality has made us unique and more flexible than many other adaptable desks for children. Quality is in the big picture as well as in all the details. 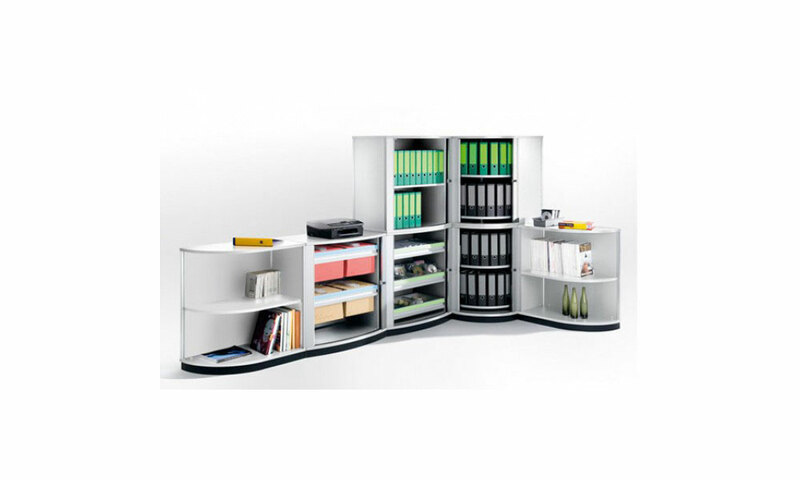 An attractive design and high-end production in Germany make our product special durable. We pursue cutting-edge development in adjustable-height and ergonomic desks, and our innovative designs and clever functionality keep our product lines at the state of the art. 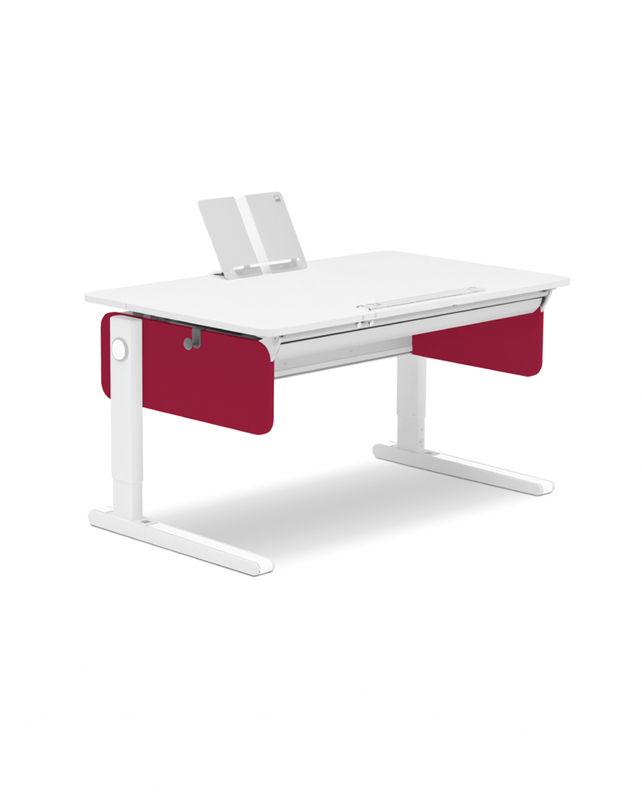 This is backed up by our many awards, such as the internationally renowned red dot design award for Desk Champion in 2012. 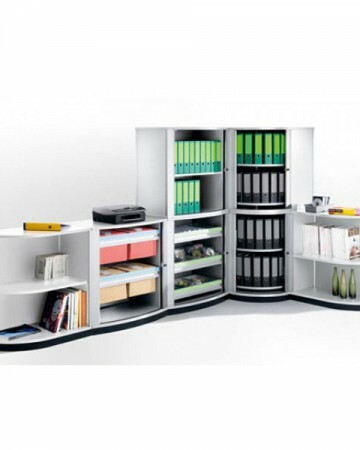 In addition to children’s furniture, we develop and manufacture “Rotafile” organisational furniture for offices and archives. Invented over 50 years ago, and still indispensable today: the rotary file storage system. 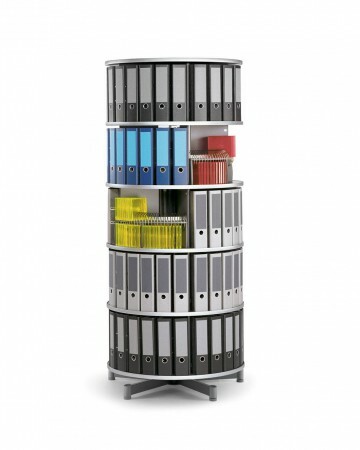 A “space-saving miracle” that can store a large number of files in a very small space. Space-saving, flexible, and extremely strong. 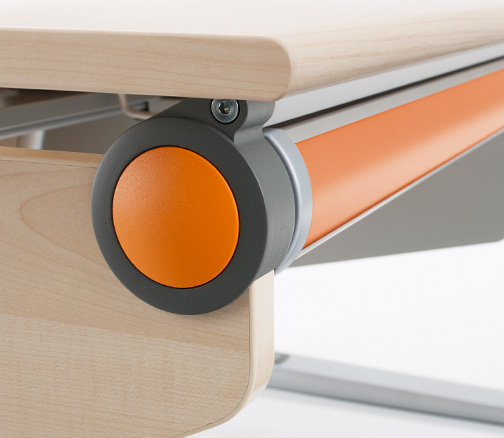 For children, even the best desk chair is no substitute for movement, no matter how ergonomic it is. Sitting for a long time is unhealthy, but you can’t always spare your child from time at a desk. However, you can influence how he or she sits. The right desk chair for your child should have good ergonomics and have height adjustment to easily adapt to children’s growth spurts. Moreover, when buying a chair, you should pay attention to its materials, because there are some hazards to consider — especially for small children. Here we have collected a few tips to remember when chair shopping. When it comes to children, safety must be written with a capital S. The German consumer report magazine Öko-Test believes this too, and for this year’s October issue they tested 10 desk chairs for children and teens. Of the 10 chairs tested, only two received the top grade. One of the two is moll Maximo (gray/red). Three of the chairs tested didn’t even make the cut, receiving an overall rating of “unacceptable”. In addition to handling and ergonomic properties, the chairs’ materials were also inspected and subjected to practical testing. Naturally, a child’s chair must also be safe from tipping over — a good chair for kids should be built to wobble a little with no major catastrophe. So Öko-Test performed a tipping test. When buying a chair, make sure it is safe from tipping over. You can check this by looking at the chair from above. If the castors are clearly visible, the star base is big enough and the chair will stand securely. To score well in the Safety category, the chairs also had to be tested for pinching hazards for fingers and feet. Can fingers get caught when adjusting the seat height, and is the chair easy to adjust? When shopping, simply have your child test that. A desk chair for a child’s room also needs to be durable, because things can get crazy there when kids are playing and roughhousing. This aspect must be considered in developing kid-friendly furniture. “The lowest possible risk of injury is always top of mind when we develop furniture for children,” says Martin Moll, moll’s CEO. 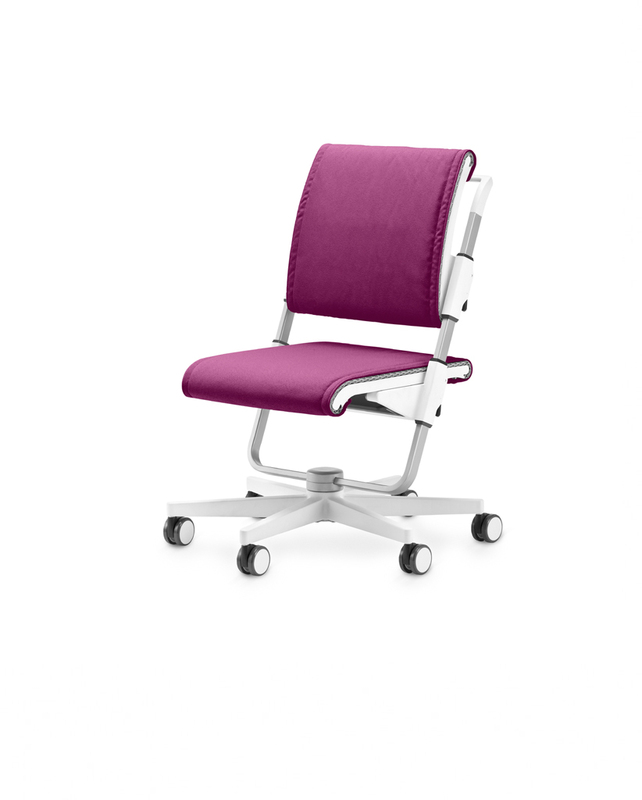 That is why moll’s height-adjustable swivel chairs — including the test winner moll Maximo 15 (grey/red) — are designed to prevent fingers from catching during operation. Make sure there is no severe pinching hazard for hands and feet. Based on the test results, Öko-Test’s October 2015 issue gives advice on buying quality products. Physiologist Dr. Dieter Breithecker, head of Germany’s federal society for posture and movement, says it’s no surprise that the cheaper chairs flunked the tests. Dr. Beithecker himself has worked for decades as an evaluator. According to his experience, it is very expensive to produce (child) safe products that are also ergonomic. It costs money for a chair to meet those requirements. 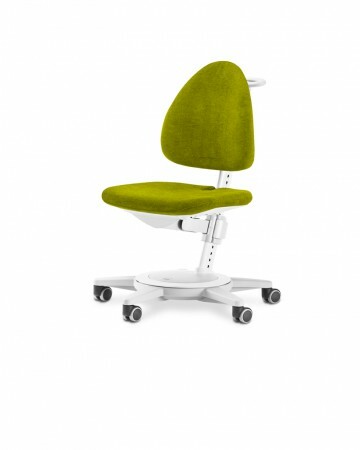 To allow healthy sitting, a chair has to be ergonomic. With swivel chairs, it is important that the backrest be height adjustable and the seat be height and depth adjustable. This is the only way for the chair to adjust to the user’s body size and proportions. 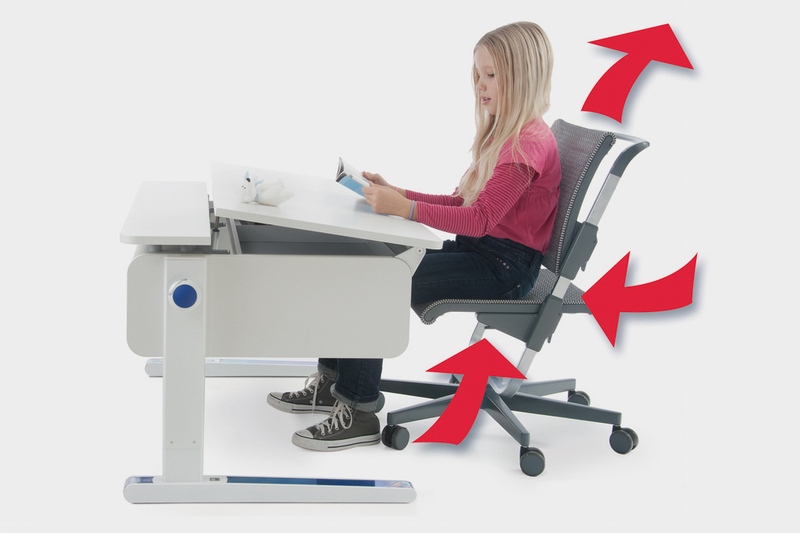 When it comes to height adjustability, you should also make sure the height adjustment range is variable enough that your child can also sit in the chair as a teen, as is the case with the moll Maximo 15 (grey/red). Buy quality and you buy for life. Now the question is whether it’s worth it to invest in a premium chair when there are cheap alternatives. When it comes to quality, health and safety, there is no question about it. The tests showed that the cheap products don’t meet the requirements in any of these three categories. And when you pick a high-quality product, you opt for both safety and long-term durability. 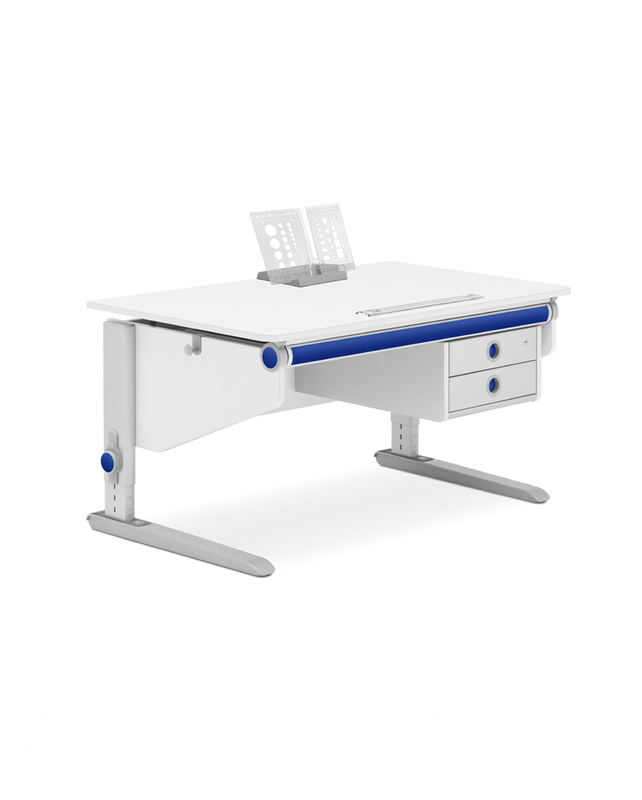 All moll desk tops are fitted with a simple and easily-operated tilting function so that for painting, writing or reading, children can always take up a healthy and ergonomically correct posture. They have all-round suitability for children: all the corners and edges are rounded off. Champion and Winner children’s desks come with a book support. If the desktop is tilted, the book support can be hung onto the desk to prevent it from sliding. There is always something to discover: stencils and magnifying glass for reading, secret compartments in the desk and chair, and a box for the painting block. The writing desks have different levels of equipment. Common to all of them is that they encourage the child to get involved with important features of learning such as sorting and putting things in order. 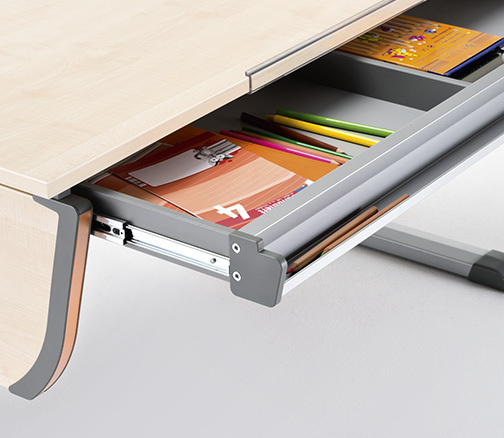 Child’s play which moll promotes by providing pencil trays and drawers. moll writing desks regularly earn top marks from ergonomists and orthopaedists; for instance, they were tested by the ‘Campaign for healthy spines’ association in 2012, and recommended. All desks, containers and additions withstand plenty of ill-treatment. This also applies to the desk tops, which are highly durable; they are made of top quality hard-wearing chipboard and are easy to clean. Sitting for up to nine hours a day – that is often the rule for children. That’s why their writing furniture should grow with them and always fit like a glove. WHY SHOULD IT GROW WITH THE CHILD? For a healthy development of the back and to enable children to learn successfully, they shouldn’t be made to adjust to their furniture; the furniture should be adjusted to the children. Since children grow, all writing furniture by moll can be matched to the actual body size and proportions of children and are thus good for their backs at all stages. 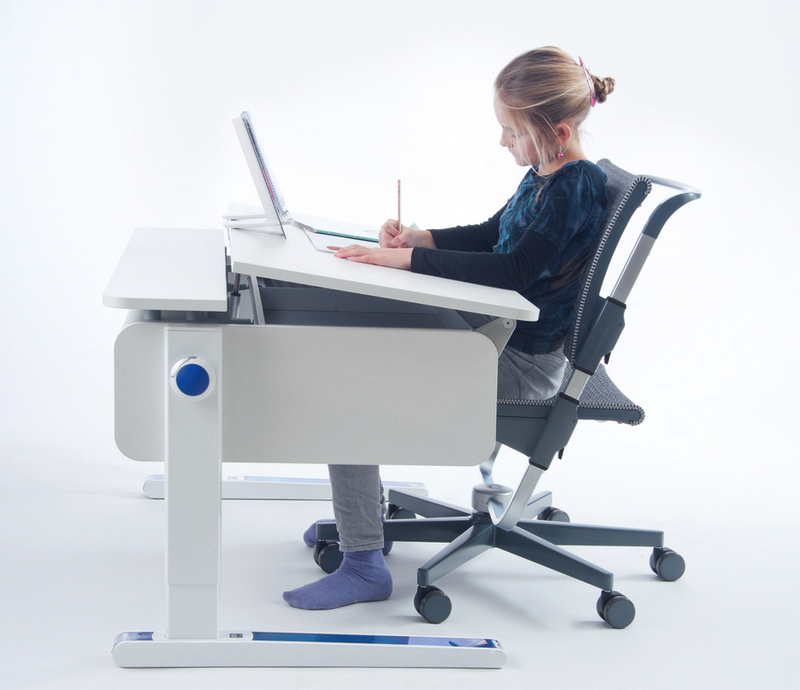 While with desks it is most important that the height is right, in chairs, it is the adjustment of the backrest and depth of the seat. Whether reading, writing or painting, there is an optimum sitting posture, ergonomically speaking, for every activity, and this can be achieved by suitably tilting the top of the desk. 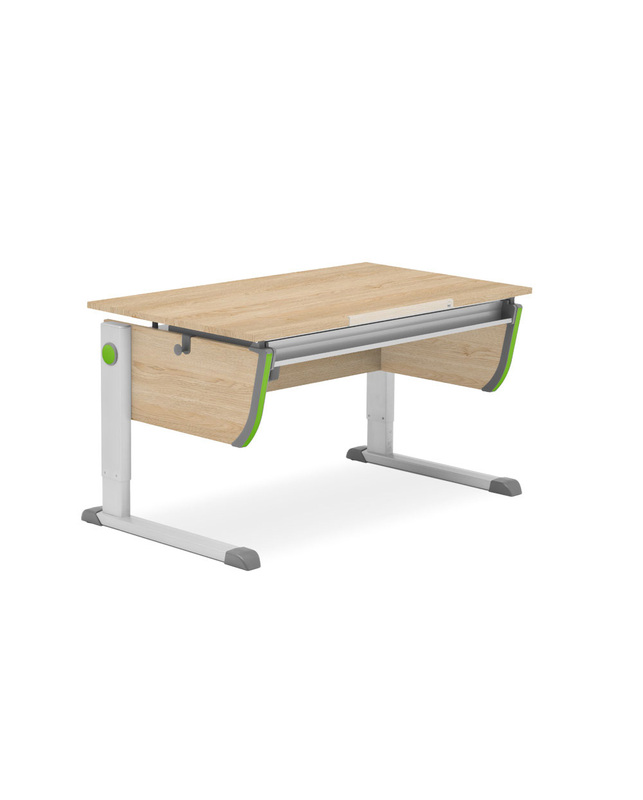 The flexibly tiltable desk tops on moll writing desks ensure that no matter what the activity is, the children can sit relaxed in a position which is easy on the spine. 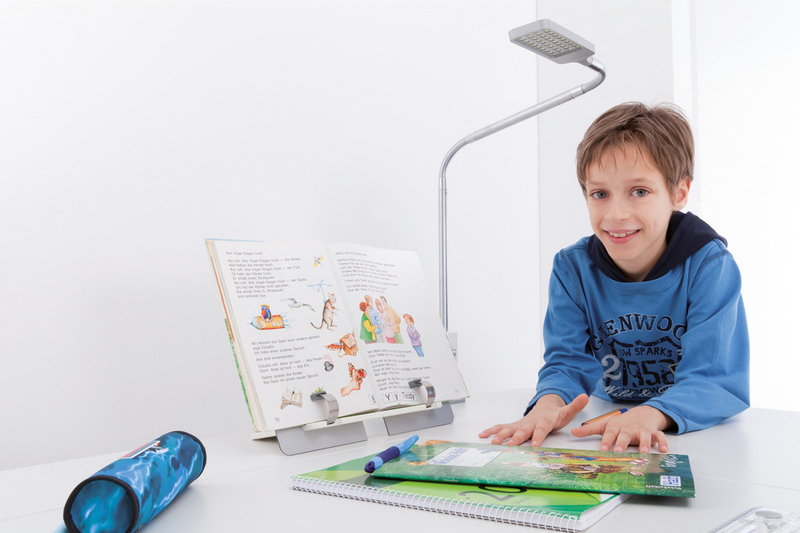 In co-operation with orthopaedists and eye specialists, moll has developed children’s desks the tops of which can be tilted by up to 20°. The patented system permits continuous adjustment which is easy and safe for children to operate. There are brakes built in to ensure the top can be raised and lowered safely. The design is intended to prevent the fingers being trapped. To stop anything falling out when the top is being tilted, each compartment has an anti-slip ledge. So: simple, made for children and safe. WHAT DO WE NEED TO WATCH WHEN A COMPUTER IS ADDED? If the distance from the monitor to the sitting position is less than an arm’s length, the eyes can easily become strained and concentration will fall off. If the monitor stands horizontally at eye level or even above that, the eyes will be permanently adjusted to long distance. Concentrating on the screen means ‘mental conversion work’, which can lead to headaches. In this posture too, one is inclined to stare at the monitor without blinking. This can cause the eyes to dry out quickly. If the arms have to stay free for keyboard and mouse without support, this can cause muscular strain even to the extent of tendinitis. The solution is a PC extension for the desk. With the fold-down monitor tray, the screen can be adjusted for the correct angle and the correct range. 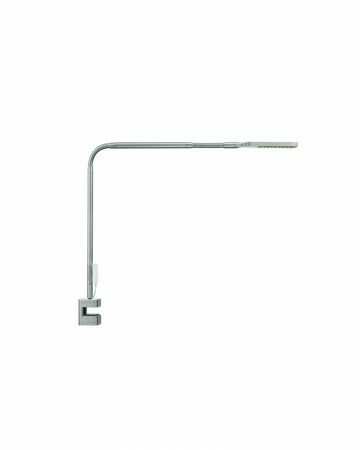 This allows you to work without stress within the natural vertical nodding movement of the head. 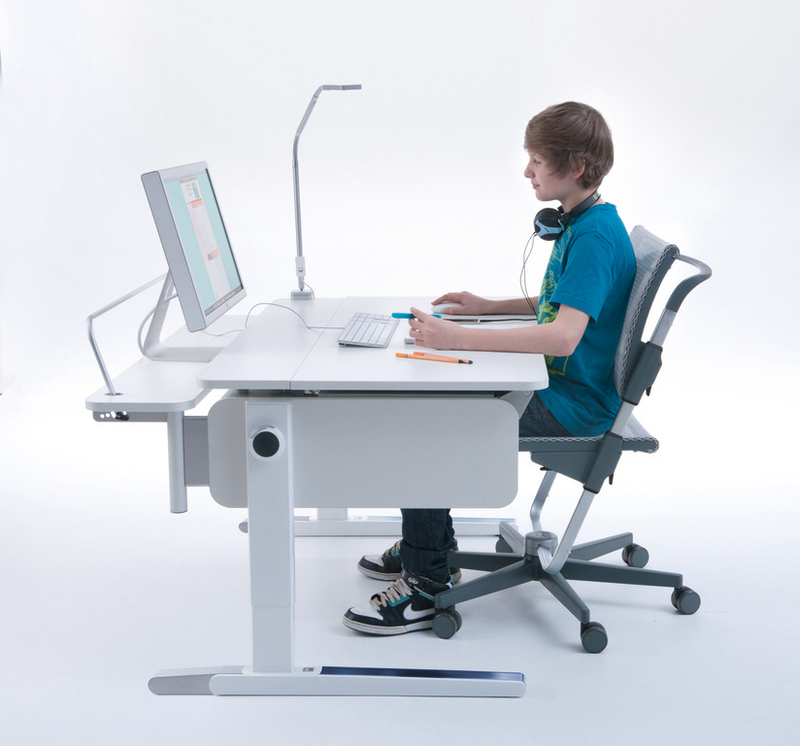 The depth of desk gained in this way makes it possible to rest the forearms and thus to work in a relaxed manner. WHY BUY A SPECIAL DESK LAMP? Adequate light ensures we feel good, while inadequate light weakens the power of concentration and can cause headaches. Since natural light is more pleasant than artificial light and homework can often be done better if the glance can occasionally stray further afield, the learning station is best sited close to the window. For the desk itself, additional illumination of about 500 lux is recommended for optimum reading conditions, as daylight and general room lighting will seldom be adequate. Light sources should be so positioned that neither the user nor any objects cast a shadow on the working surface. With their clamping feet, it is easy to fix both Flexlight and Mobilight in the position you require. moll desk-lamps will provide illumination all over the surface of the workstation and thus ensure perfect lighting conditions, whatever the activities at the writing desk are. Moll has just been nominated three times for the German Design Award 2016. The models nominated are Joker, moll T7 and moll S7. 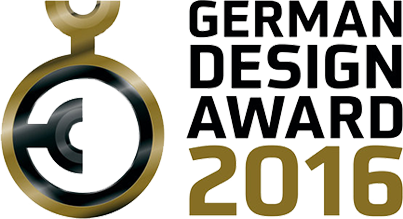 The German Design Award is the German Design Council’s premium international award. Every year, top-class submissions from product and communications design are honored, all of which, in their own way, are trailblazers of international design. For moll, design has always been an important factor in product success and goes far beyond the purely formal aspects. It also involves user needs and technological innovation, along with considering production conditions and ecology. That is why moll products are innovative, user-friendly, durable and in harmony with the environment. Those are moll’s convictions. And increasingly, these convictions are confirmed by awards. The competition makes it very demanding to choose the winners. The unique nomination process chooses products that can be shown to stand out for their design quality. A jury of international experts thoroughly considered all nominations. Based on their professional competence, the jurors perform evaluations in the competition’s individual categories. This involves intensive testing, inspection and discussion. This rigorous selection process makes the nomination itself an honor.